Remains of 2000 Year Old German Library Found – Zero Equals Two! 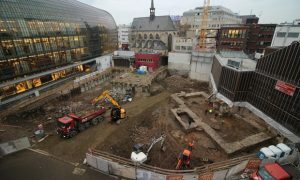 “The remains of the oldest public library in Germany, a building erected almost two millennia ago that may have housed up to 20,000 scrolls, have been discovered in the middle of Cologne. “The walls were first uncovered in 2017, during an excavation on the grounds of a Protestant church in the centre of the city. Archaeologists knew they were of Roman origins, with Cologne being one of Germany’s oldest cities, founded by the Romans in 50 AD under the name Colonia. But the discovery of niches in the walls, measuring approximately 80cm by 50cm, was, initially, mystifying. Of course, library shelves – meh! I wanna hear if they found any trace of the scrolls! I was recently watching an old episode of Parts Unknown and Anthony Bourdain kept asking why Cologne was such a tolerant diverse town and the locals mentioned that it was a trading center — but didn’t mention that it’s been one for two millenia and was established by Romans! It sorta explains some things!